We had not done a full multi-course dinner with all the wine and ado in a few months so we decided to go all out for a Summer Dinner. You will notice that it is “only” four courses. A bit small for one of our all-out dinners. However, each course was enormous and it was significant work to get through all of them without needing a bit of a lie down. The Aperitif: Because of the size of the first course, we chose not to have finger food when guests arrived. Instead, we served an Extra-Dry Champagne to set the tone. The Charcuterie portion of the first course is something I have been wanting to do for years. The weekend before the dinner, Cathy, Molly, and I went up to visit Mr.Dr. and Sandy. We used that time to experiment with sausage making. Using that experience as a base, I made the lamb sausage. To cook it, we first boiled it in a mixture of port and beef stock, then grilled it to crisp the outside. It went very well with both the Turley and the Chardonnay. The Chicken Liver Mousse was added to the menu simply because I had never done it before and I wanted three selections. That being said, it was very well received. It was light and airy, but with strong chicken and cognac flavors. It was delicious on it’s own, but did not go particularly well with either wine. The Pork Rillette was the reason for the Charcuterie plate. I have been wanting to make one since I had it at Petit Louis Bistro in Baltimore. I used Anthony Bourdain’s recipe as a guide, but used pork tenderloin and duck fat instead of pork shoulder and belly. The Turley went very well with the pork, but the Chardonnay was slightly overpowered. These three soups were all made in a similar fashion. First I simmered the base ingredients in vegetable stock and seasonings. Then they were run through the blender until smooth and finished with salt, pepper, and cream. 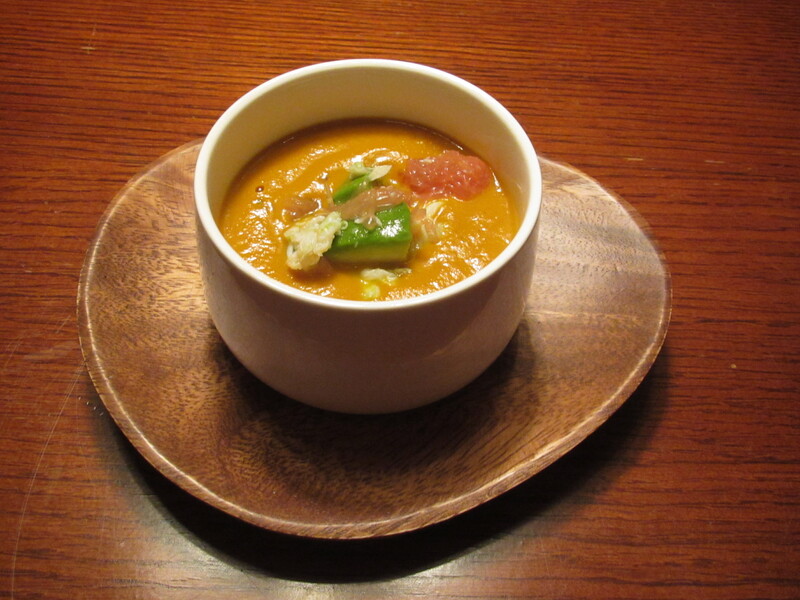 The soups, while prepared similarly, were wildly different in flavor. We decided to go with a champagne to tie them all together. The acid and bubbles in the champagne cut through the cream well, and the light flavors went well with the soups. I tried several different preparations of the hens before deciding to go with a compound butter. The hens were slathered with a compound butter of sage, thyme, and rosemary. They were then pan seared skin side down until crispy, then finished in the oven. Cathy prepared the other two parts of this dish. The hard polenta is one of her best dishes. It is creamy, and garlicky, and crispy, and amazing. The Brussels sprouts were quartered, marinated in lemon juice and olive oil, then seared until lightly charred. The wines for this course were the most interesting pairing wise. Carol Shelton does good work, and her Pinot is no exception. It was a perfect example of her style, and pairing it with the hen brought out the fruit even more. The Vacqueryras went equally well with the dish, and the pairing brought out the mineral and spice notes. Though each wine paired well, I personally preferred the Carol Shelton. One of the test batches of lamb sausage I made involved sour cherries. While I chose to go a different way with the sausage, this meant there was an open can of sour cherries that had to be made into pie. Poor us. Cathy made the pie and I made an ice cream to go with it. They were good. Moving on. The port was the crowning jewel on the dinner. It was perfectly aged and decanted (after 6 wines no less) then served in a combination of port glasses, and three port pipes. The cherry flavors were still present, and blended with a caramel/toffee finish. It was by far the best wine of the night. In all, this was a very successful event. With one small hitch……we forgot the pictures. We got so wrapped up in the dishes and service that we completely forgot about the camera. Cathy even had the batteries charging and ready to go. Ah well. I have not included the recipes for this dinner. Normally I do, but in this case, there are a LOT of them and they are mostly fairly long. That being said, if anyone asks in a comment for a particular recipe, I will respond with it. Another luscious meal. Thank you again for inviting us.